Here is another reason WHY the Series 2 has a Higher Oil Pressure (PSI) Circuit. To supply Oil direct to these Two external EMOP's which don't actually Pump Oil they direct (black solenoid on top) Oil to flow to the 4 and 2 (6) Oil Injector Nozzles from Engine Oil Pump....Oil Pressure inside these EMOP's is kept constant at 20 PSI. The 6 Oil Nozzles in S2 are all new, they have a very small single hole to one side of the injectors inner brass base (1.5mm), the oil leaves from this side hole to lube Apex and Corner Seals. Last edited by ASH8; 10-15-2010 at 01:00 PM. Thanks for the notice. I'll bring this to the attention of my shop. I read all of this, understand all of it - not in the slightest. I feel my IQ has already been improved by a few points. Series 2 only go with Mazda Genuine oil filters. Because, for the lack of technical terminology, not all approved oil filters are created equal. There are NO "approved" Oil Filters Sold Anywhere for the Series 2, only OEM from a Mazda Dealer....or Paul at Mazmart who sells OEM. 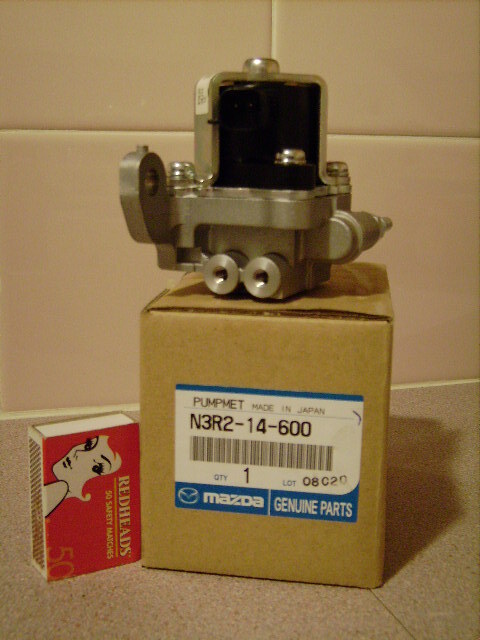 The may 'LOOK' the same, But the internal By Pass Valve is rated TOO LOW. When Oil Filters LOOK the same but are Not. YES they look the same, but they are two different Mazda Part Numbers and for two different Mazda models (Note the B6Y1 Oil Filter is also used on Series 1 RX-8's). The reason I posted this is to show that many non genuine Oil Filters can also 'look' the same as the (larger N3R1) Series 2 RX-8, but internally they are not rated the same. In this instance the Skyactiv-G (2.0 CX-5, 2.5 2014 Mazda 6, Mazda 3) PE01-14-302 Oil Filter is also specific for this SA-G Banger Engine ONLY. ASH8 where did all the good parts guys go ... shortly after my local stealership parts guy made fun of me for not buying a front license plate mount and making one for about 2 dollars ... he handed me the wrong oil filter. I proceeded to tell him keeping my 13B-MSP away from people like him is why it still runs perfect. Well that's good to know... I was just about to ask for those with the Mazmart oil pressure bypass, would a series 2 filter be needed. But I guess not? Team... so what's your take on this? Should S1 Mazmart oil bypass owners use S2 oil filters or?? Sheesh, I should have known. Obviously.... however, car makers (good ones) usually engineer for worse case scenario. You would be surprised just how many owners do not maintain or change their Oil Filters when they should, that is the purpose of a By Pass Valve (Plate or Spring) to allow continued engine oil flow when filter media is blocked/restricted. As I have said, in 'a' case an owner using a weaker by pass Oil Filter (like S1 in S2) could/would encounter an earlier by pass function if their filter media was very dirty. But one would never know...would they. Mazda would not have specified the S2 Oil Filter if they found it was not necessary and the fact that the S2 also has a higher Oil Pressure System. BTW:..It looks like the Skyactiv Banger Oil Filter (PE01) will fit on Series 1 RX-8, perhaps I might find out the rating of this ALL new 'Skyactiv' Oil Filter. I wanted to add a few details I didn't see in the thread. Royal Purple (incorrectly) recommends part# 10-2867 for S2s. Again, it has a bypass of 11-14psi. Someone asked about Mazdaspeed part#QYY1 14 302. I didn't find the bypass rating, per se, but that part number appears in the forums as far back as 2004, so presumably it doesn't have the S2 pressure rating either. Mobil 1 still hasn't released a suitable filter. Some guy on a Mitsubishi thread did a crazy teardown and comparison of a huge variety of filters, all of which seemingly are properly threaded and dimensioned for RX8s (which is not necessarily to say they should be used on an RX8). Alas, none have the S2 pressure rating, but might be interesting reading for S1 readers. You can find it here. Thanks for your info, but this thread is not about Series 1 Oil Filters, those S1 owners have way more oil filter 'choices' than S2 and has been discussed for many years in S1 forums..
For S2 there is still only the one to use and that is the Japanese made Oil Filter, made exclusively for Mazda and their Renny II with different oiling system and higher pressured system than the S1. In the end all good Oil Filters filter the engine oil correctly, THE issue is really for those owners who make their engines and oil filters go for far longer than the normal desired distances without changing Oil, and or who are lazy with filter renewal. The only reason why an Oil Filter element goes into by-pass mode is when it is blocked/restricted or very old, by-pass occurs so engine is not starved of oil and oil flow, once by-passing occurs oil is not being correctly filtered, so put the wrong lower rated new oil filter on and you run the chance of filter cone not seating (and going into by pass mode at an early age), you will never know IF it does....do you want to take that risk? Just stick with the OEM N3R1-14-302 for Series 2 RX-8. Mazda for the first time in 30+ years changed the Oil Filter in S2's for a reason and also made filter media larger. None of the parts associated with oiling system has ever been used before on any previous Rotary. Oh, I plan to stick to the OEM model. I was just noting that their are still lots of filters from reputable brands that are listed as compatible with S2s but in fact are not, since lots of people seem to be curious. NONE of the 3rd party manufacturers seem to have gotten the memo when Mazda changed the by pass rating, and since the RX8 is no longer in production, unless Mazda starts putting the high pressure filter on a different model, I see no reason to expect any 3rd party will ever produce an S2 compliant filter. If you're running mineral based oil and replacing it every 2500 miles, use whatever filter you want. If you're running synthetic and replacing it every 9-12 months, it would be seriously foolish to use anything but the OEM filter. The bypass pressure is a non issue unless you don't change your filter often enough and it gets clogged. So as long as it is the same physical size as a standard S2 filter then you are good. As Ash has mentioned above - fitting one with too LOW bypass pressure means that it is going to be bypassed, when "less" clogged in the higher pressure S2 oil system?? If it is a none-issue, why did Mazda change the part? Your filter should not be clogged at all if changed regularly so it should never bypass due to that. If you are worried about it then use the proper equivalent filter. If you can't find the bypass rating on that ADM then don't use it, get one with proper specs. Maybe it's just me, but my oil seems pretty damn clean when it comes time to change it. It's not like my truck or any other piston engine I have owned. Seems very little of the oil ever sees contamination. At least not from the burning fuel/oil and other operations. The only thing in the oil is most likely bits of metal that wear down in the engine. Especially when getting broken in. I doubt the filters get all that dirty in most of these engines. I could be wrong I guess. Looking at oil is not really an accurate way of testing it. I know that. But I don't have a lab handy. You can get an idea how dirty it is though. But no clue on breakdown. Is it recomended to use the HKS Hybrid sports oilfilter for R3 . Due to B Goodwin info, it is ok !